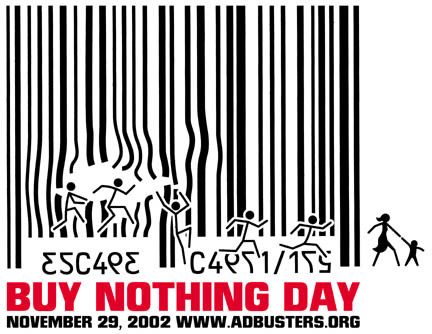 Tomorrow is Buy Nothing Day in North America. I've been aware of this day for a few years now, but don't think/know if I've participated in it in the past. I have a feeling I didn't buy anything anyways, other than lunch, which is ok by me as you need food. But this year I'm fully supporting and adhering to this day. Maybe it's because I'm broke, maybe it's because the city I live in is quite gung-ho on making this day a success. Either way, I'm not going to be buying anything tomorrow. I'm thinking maybe I have it easy though this year, even with a baby in the picture. I haven't been wanting to go shopping - most likely due to the fact that I'm not at my pre-pregnancy self yet and just feel overall gross, so the idea of shopping for clothes is the furthest thing from my mind. Although, with that said, I did go to The Gap last weekend and bought a pair of jeans. But in my defense, I had to buy a pair of jeans cause I can only go so many weeks of wearing my maternity pants (still!) and yoga pants. I don't want to turn into one of those moms that live in their yoga/stretch pants! Hells no!! Anyways, Brett and I already did our weekly grocery shop, I don't need to buy anything for my sewing/crafting since I don't see myself doing such activities tomorrow, which comes to my last point...tomorrow I'll be moving. I'll be way too busy tending to my son, trying to pack as much as I can while he's napping, and hopefully will be downsizing while I'm at it. Not counting on it, but am keeping my fingers crossed! Back to Buy Nothing Day. Support it. Google it and read up on it. Please, don't buy anything tomorrow. I know Christmas will only be 27 days away by then, but I think people need to re-assess what they need and want. If you want to be frivolous, then why not make your gift? Put your artistic side to the test and make your boyfriend/best friend/mom/dad/grammy/whoever a thoughtful, personalized gift that's from the heart?